Does anyone have one of these traffic camera flash detector units? Does it really work? I think the Myth Busters did a show testing all the various contraptions. None really worked. As far as Amaranth, it is very nice in person. Very similar to the Ruby Red from the 997. It has a slightly more brown tint though and looks a bit muddled in low light. In the sun it's awesome. Right now, that's what I have ordered. I may still change it to Sapphire Blue before the freeze date. Probably a better GT3 color - and significantly less expensive. Had Guards Red before - too much for me. The Amaranth Red metallic looks nice and deep. Those who ordered guards red, did you consider the Amaranth Red metallic? Anyone has pictures or seen this color in person? I thought about it. It looks nice in pictures, but I don't like it any more than Guards and it's a $3K option. I was also hesitant to consider something that I hadn't seen in person. Guards Red is a classic Porsche color and I felt it was more appropriate to the GT3, but YMMV. I have seen Amaranth, but ordered guards. They are completely different. I saw the Amaranth car in bright sunshine and IIRC it had a lot of orange in it. In any case, I didn't give it a second look. Certainly agree having more choices would be nice, and wish that the "special colors" were more reasonably priced. The only colors that I personally considered seriously were the silvers and red as for one reason or another none of the others did it for me, and some of the choices from the recent past like Meteor Gray or Maritime Blue that I might have considered weren't available as non-PTS colors. My last 3 Porsche sports cars were silver so I had to go red this time. I have really enjoyed reading the comments from everyone. Interesting and entertaining. I'm again learning toward Guards Red. I think we've settled that I could sell a GT3 in any color but purple this fall, and find plenty of buyers. Now it's finding what feels right. The car is so bad-*** that anything but racing white, red, or black seems to slight its capabilities. If I keep it, I would likely drive it a lot, could become a DD. Red seems a little over the top for a DD, but hell, I'm in my late thirties, I want to go red while I still can. Not sure if I'll order any non Ferrari sports car in Red, when I reach my seventies. However, I'm not really a "look at me" kind of guy, so Rhodium silver is still a close #2. Decisions, Decisions. Last edited by Drifting; 11-20-2013 at 11:47 PM. Reason: . Having had 6 911's in black and yellow, a red fiat, and a **** ton of bmw's in black and white, being in my 40's, it's not about 'looky me colors'. It's about what makes your heart skip a half beat when you open the garage. I think we've settled that I could sell a GT3 in any color but purple this fall, and find plenty of buyers. No, purple will sell too! 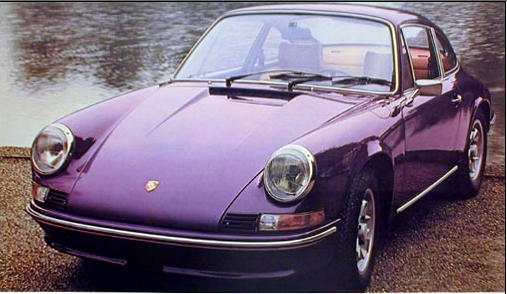 You shouldn't underestimate the beauty of 'Aubergine' on the body of a 911 Porsche! So don't sell this gorgeous 'eggplant' hue short! It is a historic 'long hood' factory color (MY1972/1973) that might look damn good on a 991 gt3...if someone is daring enough to special order via PTS! Eduardo, in the GT3 paint to sample thread (post #65) there's a pic of a car (shown below) identified as Aubergine that looks much different than your photo above. Hard to believe that lighting or the tint in the pic is the cause. If this isn't Aubergine, do you know what it is? The pic I posted was of recently painted Aubergine, indoors, using a digital camera. reflection on the door, you can see how the Aubergine shows more blues with outdoor light. Here's an outdoor pic of Aubergine, using a digital camera, which shows the more blue (purple) tone while outdoors. Personally I think GT silver is one of the classiest and oddly "complex" colors offered for the new palate. Agate is OK, White is always hot just not my sports car color of choice, the blues are nice but boring for blue...and red/yellow was a no go for me...so I went GT silver (after seeing rhodium was too light for me). Thanks for the explanation, A432! Sechsgang, GT Silver is a great color. I've had too many silver cars so "had" to do something different, but GTS is a wonderful choice for the GT3. Choose the color you want provided that it's not a super polarizing PTS color. Like a nasty green or violet or something. All the mainstream colors should prove easy to sell given the supply demand curve around when you would sell. Picking your color has the added benefit of hedging your bets since there some probability that your oversees plans could change and/or you decide to hold the car. Black is awesome but (i) it's a PITA having owned 5 black 911's including my current 3.6 Turbo, and (ii) while great for that stealth 'murdered' look, it doesn't show off the lines of the new car at all, and w/o much silver/chrome accents it looks too washed out to me. White: as you said not an option. I agree with this. Red: I chose guards for my upcoming build. I've had a Ferrari in red and I don't think you need to 'reserve' it for the italian machine. And, I actually prefer F cars in grigio and tdf blue cause red attracts even more (unwanted) attentioon from a car that is already rare and over the top. I haven't owned a red car in nearly 20 years (except for the Ferrari), but the 991 looks great in red so I had to do it. Yellow: I loved my speed yellow GT3 but been there done that. It's even more polarizing than red. I sold it after 6 months cause I decided to pick up an older, rarer aircooled car and buy a second home. But, if it's any help, I sold the GT3 within 4 days of listing it, and I had people coming out of the woodwork to buy it. Silver: I don't like silver in general b/c too common, but even I will admit that the 991 looks great in rhodium. Not enough for me to choose that color, but it looks great. Color is the hardest choice. I'm actually contemplating PTS in Mexico Blue or Gulf Blue. 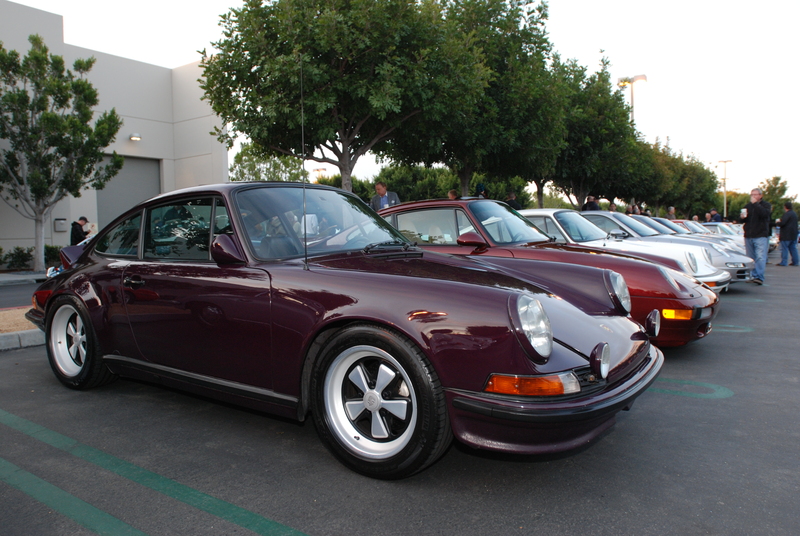 . . . .
Mike: The factory original 'Aubergine' color of the 1972/1973 911 was pretty spectacular. 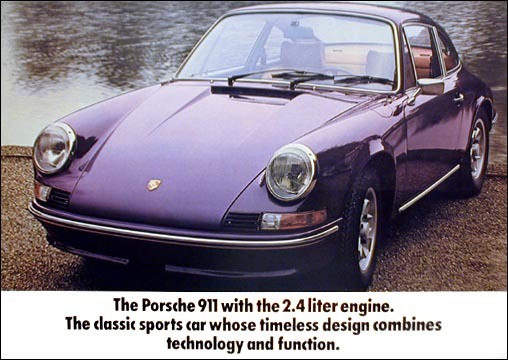 I was around Porsche dealers in 1973 and remember that 911 color at the showroom floor! Like many dark hues of old, it doesn't age very well with time on an original paint car. The paint technology then was not as advanced as today's. 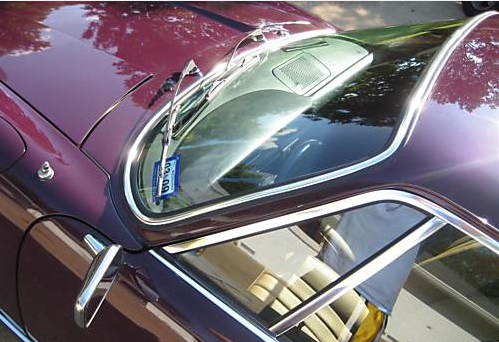 And one has to be very careful with cars that have been repainted 'Aubergine' since many may not have been truly copied correctly re: the original paint formula. Finally, photos often do not capture correctly certain colors of paint. 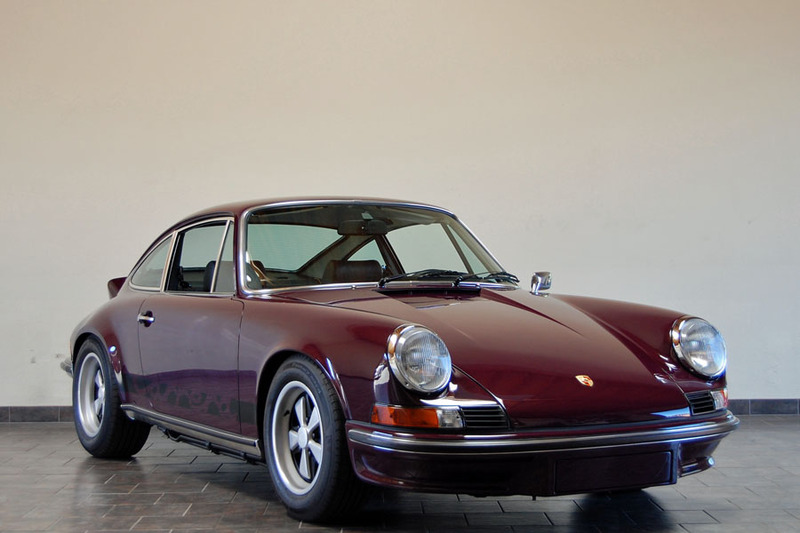 Some of you might remember my friend's (fellow R Gruppe member Kent Moore) original 'Aubergine' paint 1973 911T Coupe. It had only 700 miles when he bought it several years ago! Here is the interesting story of this car as reported by Excellence (which also includes a photo gallery of it). The photographs of the car reveal how difficult it is to capture the essence of this rare 'Aubergine' factory original color!